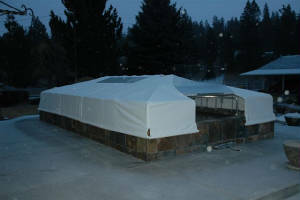 Our September workshop included a presentation of existing winter covers. Members viewed pond covers that have been created and discussed pros and cons of the structures to learn from everyone else's experiences. 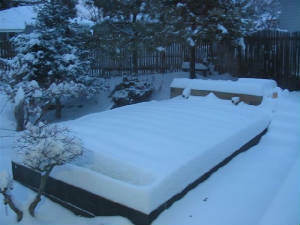 Dan & Sharon Olson have covered their heated pond and enjoy watching their koi during the winter. 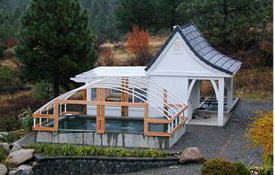 Olson's framework for the covered quarantine pond at their old residence last year. 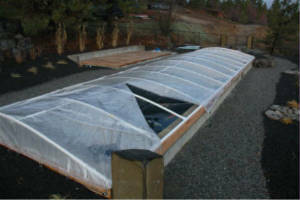 During the winter the frame was enclosed in plastic. 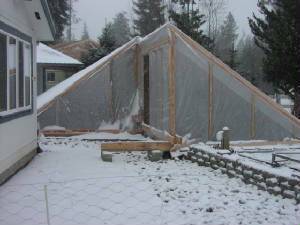 Gene & Phyllis Anderson covered their outdoor pond and attempted to heat the water - the next year the indoor Redneck Koi Barn began - and is still a work in progress. 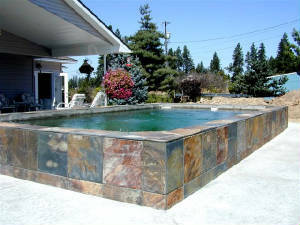 Fred & Dotti Gurney's beautiful new koi pond in the summer - the winter cover is shown in the next photo. 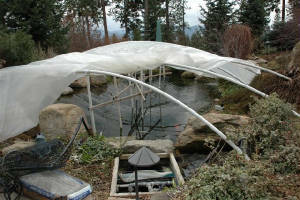 Robert & Waunita Fischbach heat their koi pond in winter and have built this cover to protect the pond and contain the heat. 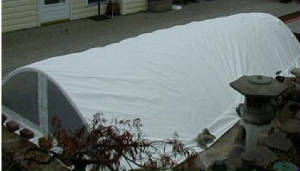 John & Ann Trevethan have devised this functional pond cover after some trial and error design work. They shared their experiences with the group to help others avoid the same pitfalls. 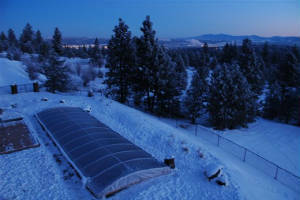 Here's another winter view of Harmon's pond before the new cover.